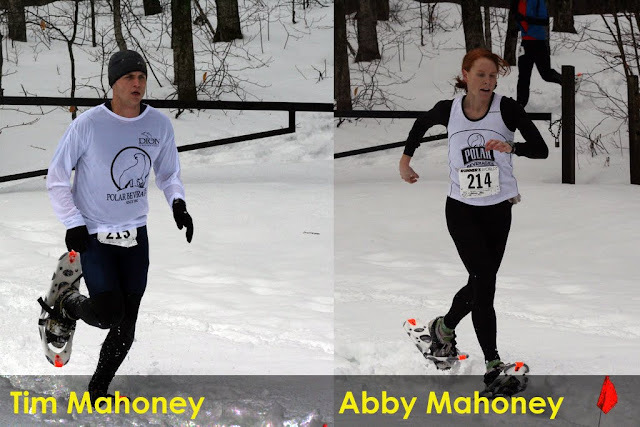 Another pretty light week on the racing circuit in New England, but it did see, the first WMAC/Dion Snowshoe Series event in Woodford, VT on Sunday (27th). It was the I Love Woodford 5k and it was well represented by CMS who took 6 of the top 11 spots and the individual race winners were Jim Johnson and Abby Mahoney. Writeups: [DD's Blog] [JJ's Blog]. Photo above of Tim Mahoney and Abby Mahoney (otherwise known as the plural of Mahoney which is 'Mahoni') from the end of Woodford. Entire photo set here. On the quicker side of things, 2009 USATF-NE Grand Prix Champion Justin Fyffe battled a quick field in the 11th annual Millenium Mile in Londonderry, NH. Justin was 2nd overall in an official 4:08 although word is that the times were about 3-4 seconds slow for some reason. Pete Najim (Derry, NH) was really around 4:01 and Justin 4:05. Other than those two races, the one other even that attracted some striders was another Mass event, the second of a few Boston University Mini-Meets that will take place this winter. Greg Hammett did an even faster double this week as he ran both the mile and 800 meters. A very light week on the racing circuit in New England this week, as Tivo (pictured right at last year's steamy Greylock Glen Snowshoe Race) cranked out a nice win out in Springfield. The CMS 52 Week series ran race #52 out in Worcester, MA this week. Full results are here as 27 brave souls (24 of whom were CMS) battled freezing temps and got a good solid 5k in before the blizzard rolled into the region. Other than those two races, the one other even that attracted some striders was another Mass event, the first of a few Boston University Mini-Meets that will take place this winter. A hearty group of striders made the trip into Boston to run races from the 800 meters up to the 3000 meters. In addition to another Mini-Meet next weekend (26th), there is also the first WMAC/Dion Snowshoe Series event in Woodford, VT on Sunday (27th). It is the I Love Woodford 5k. There will be a crew of striders going out this coming weekend. If you want to hitch a ride, let us know. Happy Holidays! 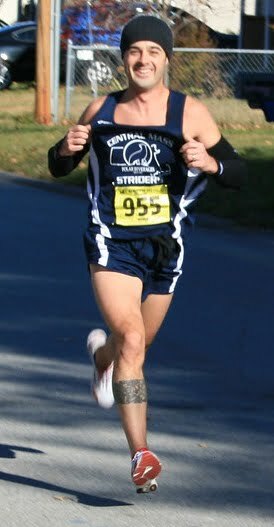 As the year winds down, we'd like to give a big Congratulations to CMS Men's Open Team member Justin Fyffe (Dummerston, VT) for taking home the individual title in the 2009 USATF-New England Grand Prix. Justin's individual title is the 8th for CMS as he joins some good company in Dunham (3), Fram (3), and Morse (1). Dunham won his first 5 titles as a GLRR member and his last 3 with CMS. Justin (who was the 2008 USATF-NE Mountain Champion) led the CMS Men's team to it's 17th Grand Prix title in it's 24 year history. 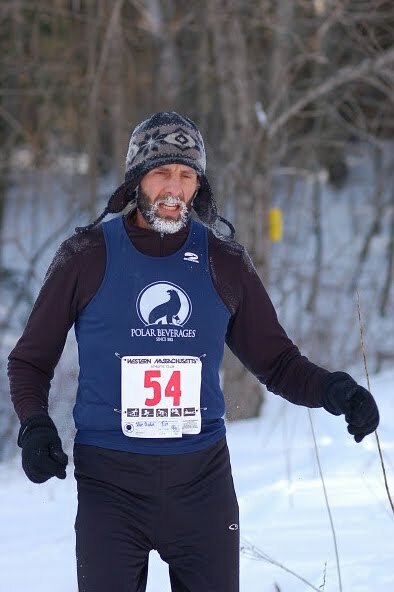 His scoring races include a 5th place / 51:47 (5:11 pace) at a very challenging DH Jones 10 Miler in Amherst, MA, a 4th place / 38:19 (5:09 pace) at the Bedford 12k in Bedford, NH, a 3rd place / 23:54 (4:52 pace) at the Ollie Road Race in S. Boston, MA, a 3rd place / 30:40 (4:56 pace) at the Lone Gull 10k in Gloucester, MA, and a 2nd place / 2:28:15 (5:40 pace) at the Baystate Marathon in Lowell, MA. 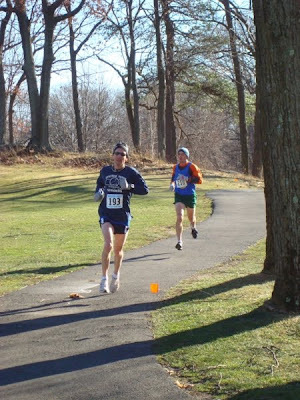 Justin did race two other GP events in 2009 (New Bedford Half Marathon and the Rhody 5k), but an untimely bathroom stop knocked him out of the half marathon scoring, and a tenacious spring racing schedule knocked him back a bit for the 5k. He didn't need either one of these races to win the overall title however. Earlier in the season, Justin placed 5th overall at the Vermont City Marathon in Burlington, VT with a 2:27:32 (5:38 pace) and placed 2nd behind multi-national ultra champion Michael Wardian at the US 50k Road Championships in Caumsett Park, NY. He also went undefeated in a handful of other road and snowshoe races he ran in the winter and early spring. Most recently, after winding down the fall season (which also included a win at the Clarence Demar Marathon as a 'workout'), Justin represented the United States at the World 50k Trophy in Gibraltar, Spain.